Those of you who have the UK editions of the Red Knight know that the cover and the internal illustrations are not ‘generic’ and represent characters and scenes from the book. The chapter heads were drawn by my friend Dimitry Bondarenko, and some of them are portraits of people and artifacts and costumes that inspired characters (and armour) in the book. 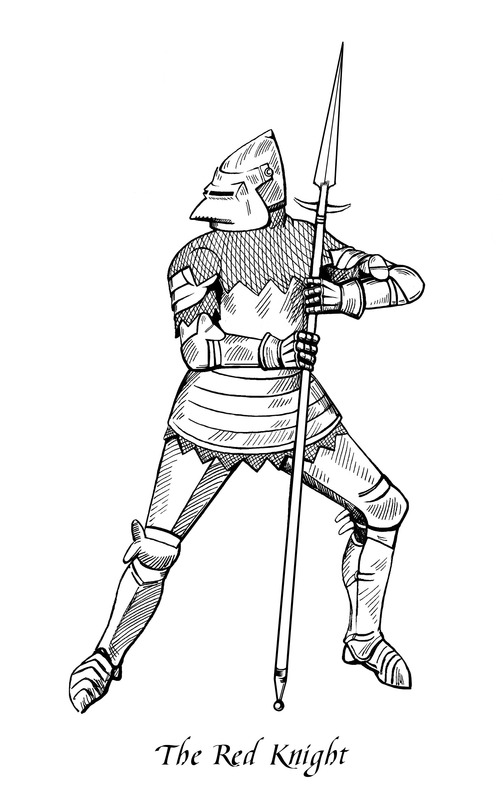 Perhaps the most oft-repeated image from the books is of the Red Knights ‘falcon-beaked’ helmet, which I confess is my own fighting helmet, a late 14th century bassinet based on an original and made by Craig Sitch, the master armourer at Manning Imperial in Australia–one of the world’s great craftsmen, as well as a pillar of the world reenacting community, a fellow historical armizare practitioner, and one of my favorite people. 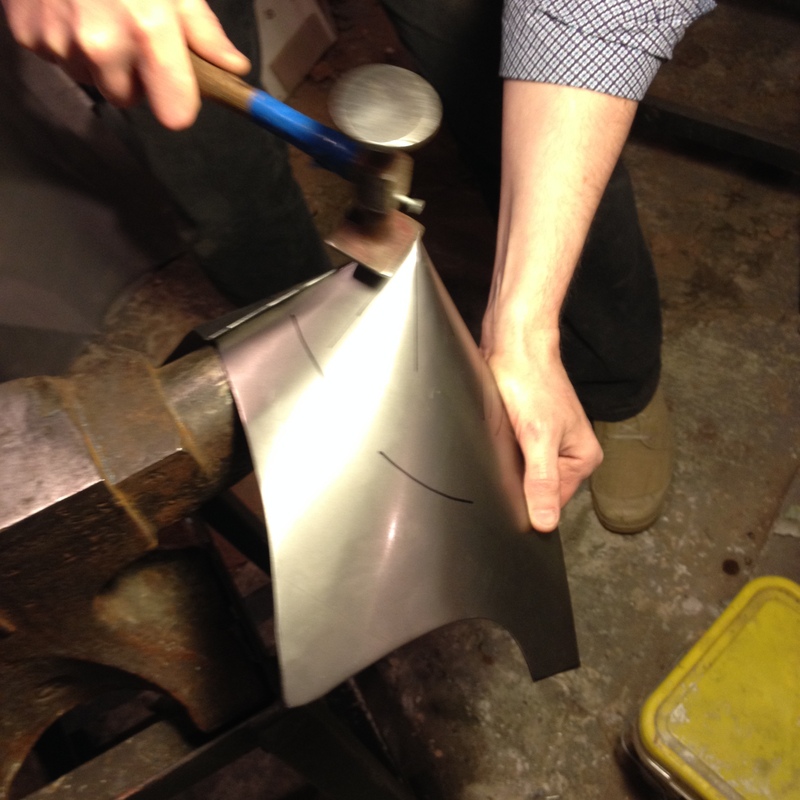 But today’s article is actually about the process of the fabrication of armour; about craftsmanship, and what it means to the people who practice and consume it, and how all this effects writing. 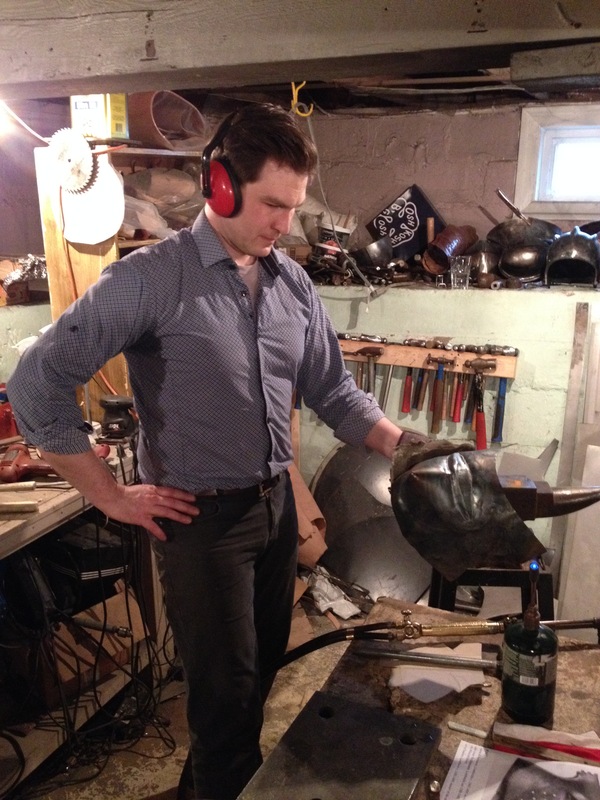 In specific, although I’ll reference a number of other armourers, today’s article will spotlight Canada’s own Jeffrey Hildebrandt of Royal Oak Armouries. For those of us who experiment with the fighting styles of Medieval knights, this is a crucial, and expensive, world of past technologies, fit, form, style, and most of all, craft skill. You can buy armour fabricated in India or China and it is made to some standard sizes and you, the customer, have absolutely no control over how it was made–how good the steel is, how thick or thin the protective areas are… or, most of all, how it fits. 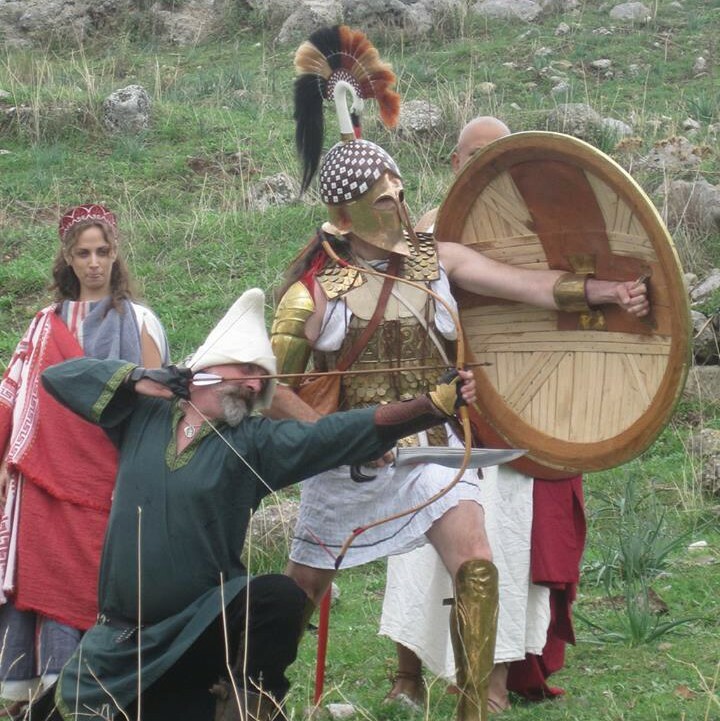 At the other end of the spectrum, there are working armourers in North America and Europe who build armour for discriminating collectors, reenactors, and the (small) world of the armoured fighting community. They make armour to order, much as it was done in the past, albeit with modern tools, computer images of old armour, libraries of data on originals, oxy-propylene, modern cutting sheers and a host of other technological improvements–and yet, when these craftspeople get down to the fine art of recreating a complex curve, it’s done with heat and hammers and anvils and shaped stakes, exactly as it was done in 1380. And what they make is, in terms of make, thickness, weight, ‘wearability,’ and fit–as good or better than the originals. 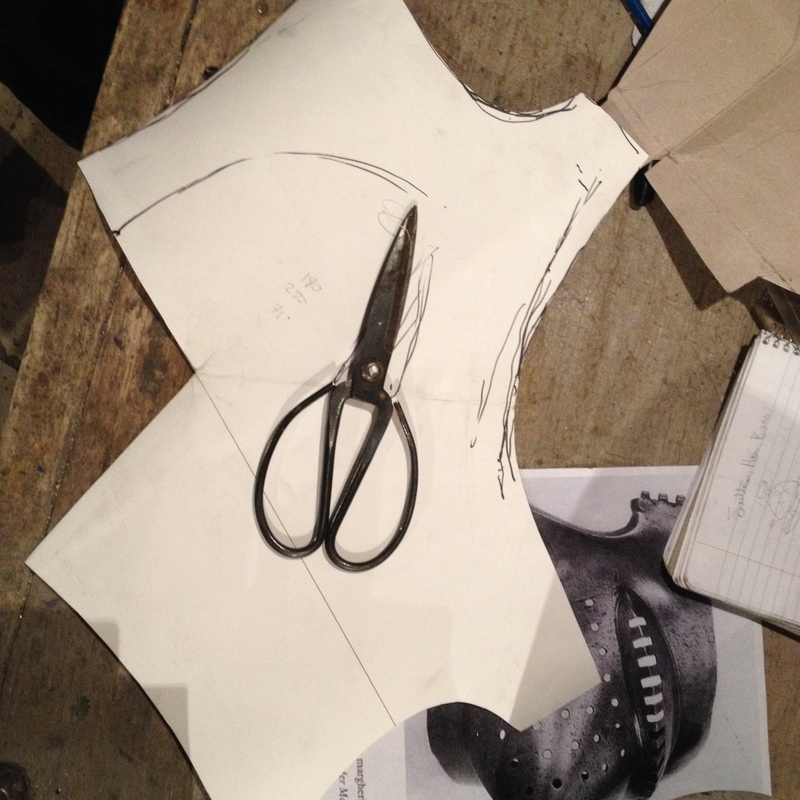 The best makers can translate the armour on a statue or in a painting the way a costumer does with cloth–except that cloth doesn’t need three dimensional flexibility and most costumes aren’t worn for sporting events…. Aurora Simmons is one of my oldest friends, and Dmitry Bondarneko used her as his model of Sauce, who, you’ll notice, is not wearing a helmet. When this drawing was done, Aurora didn’t have a good period helmet of her own. And recently, I discovered that I had in my basement a really nice bassinet ‘shell’ or basic helmet, without a visor, made by Craig Sitch back in 2010. It’s a long story. 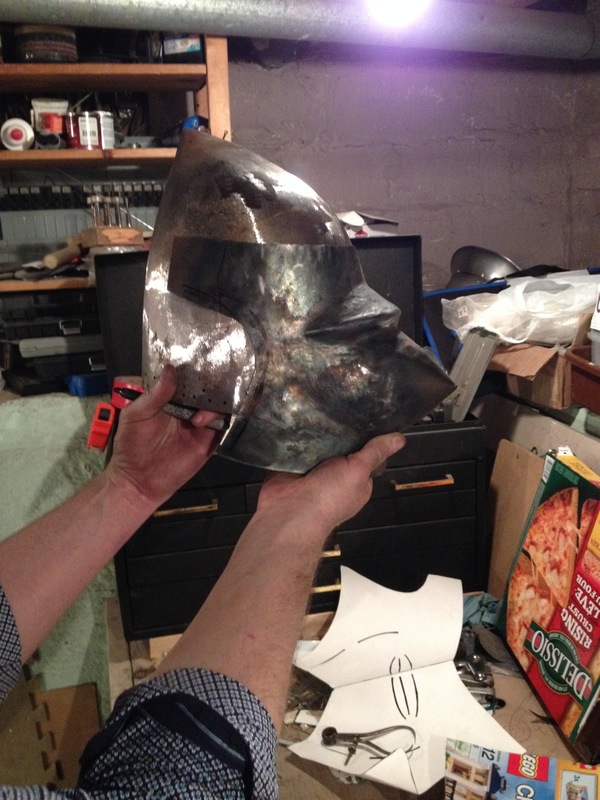 However, as I was going to spend a day with Jeffrey Hildebrandt, and we wanted to see him work on something, the solution seemed obvious–a distinctive visor or face plate for Aurora’s helmet. Now–one last aside–Aurora is herself a jeweler, a skilled metalworker, and so she wants to finish all the metal herself. Most people do not! 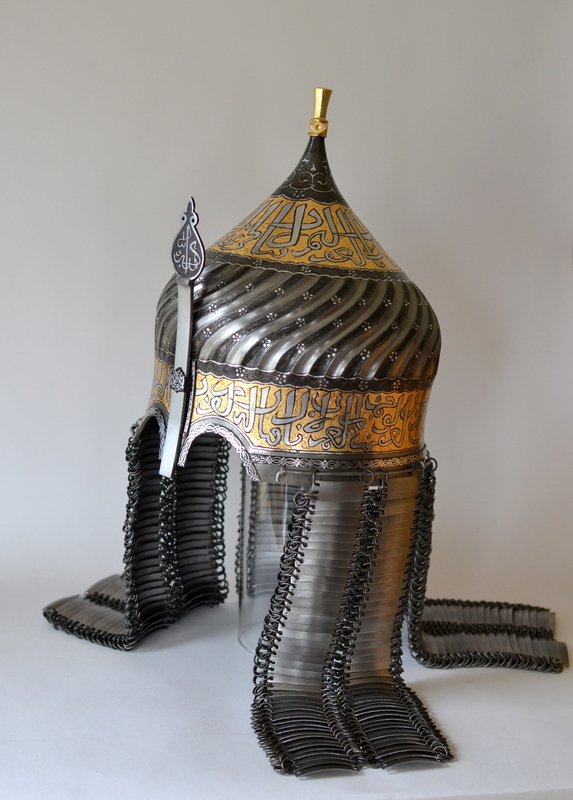 The visor on a helmet turns out to be the most complex set of three dimensional shapes that an armourer would face in the late 14th century. I had not known that. 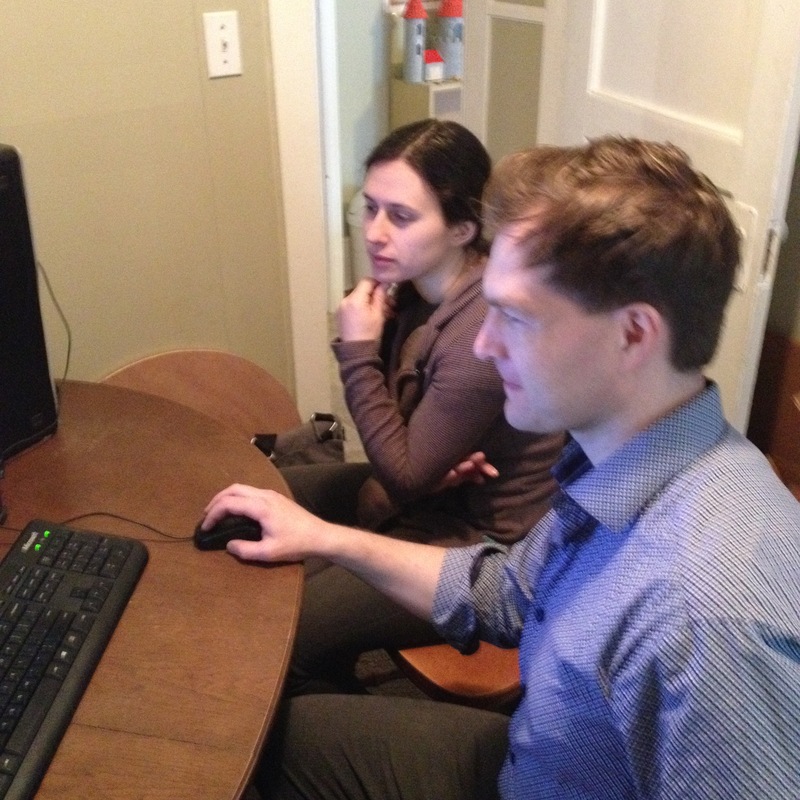 But it set Jeffrey an interesting challenge, and he and Aurora began by looking through his impressive image catalog. Very quickly they chose an original–in a museum in Germany, I believe, and they proceeded to the shop. 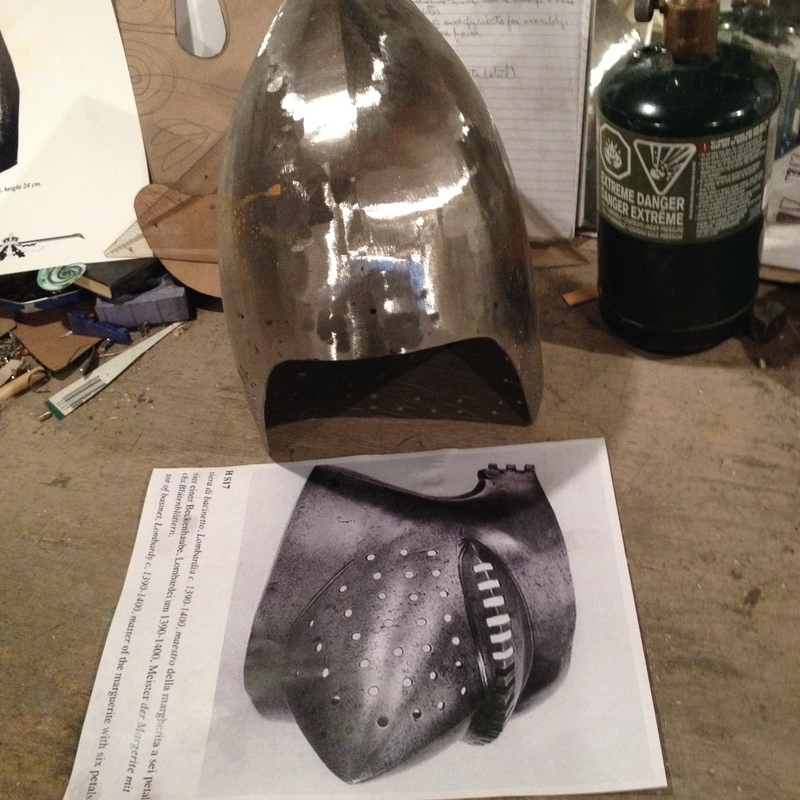 This process led to what was (to me as an author) a fascinating conversation about ‘identity’ and helmets. We all noted that every single ‘pig faced’ bassinet seemed different from the others. I realized (I’d never thought of it before) that helmets are very recognizable when everyone has a hand made one, and that it was by ‘helmet beak’ and not by heraldry that I often identified friends and adversaries in melees. Was that why they were all different? I don’t know. 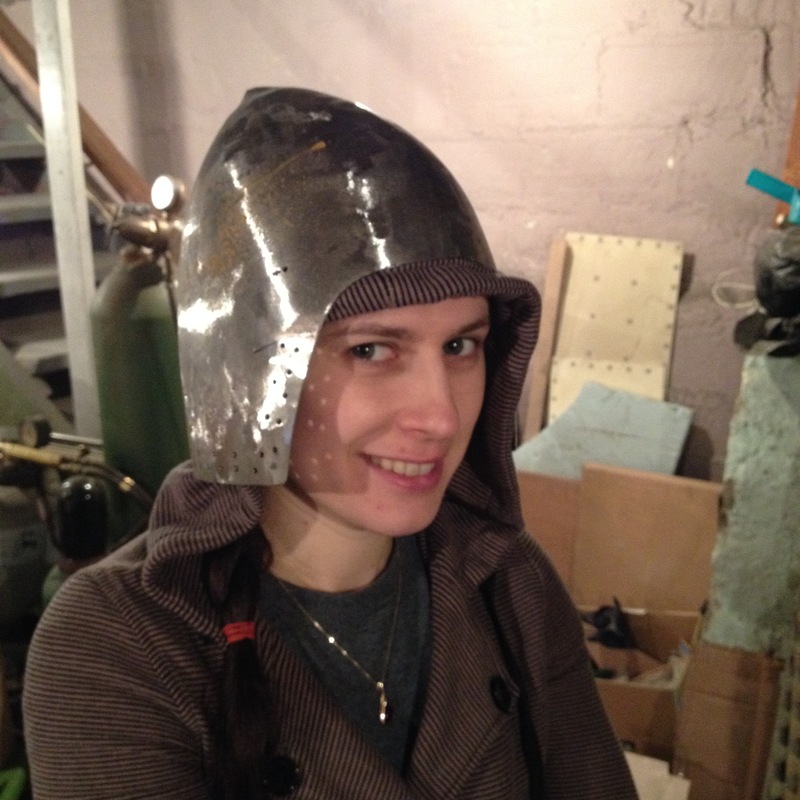 But (lesson one from the day) people can identify each other in armour, by helmet design. Cool. There ensued a fun conversation about cones and… gasp… math. Yes–those cones that have conic sections when you do calculus. It turns out that forming a visor begins with making a pattern based on a cone, and guessing–in Jeff’s case, intelligently guessing–where to move all the metal to end up with a visor. This is where Jeffrey made the first remark I loved. ‘Steel is fluid,’ he said. ‘Metal is plastic,’ answered Aurora, as if they were monks in some metalworking order. Fair enough. Raising, though–causes things to get THICKER in that you use a hammer to pull the metal together and contracts the surface area. 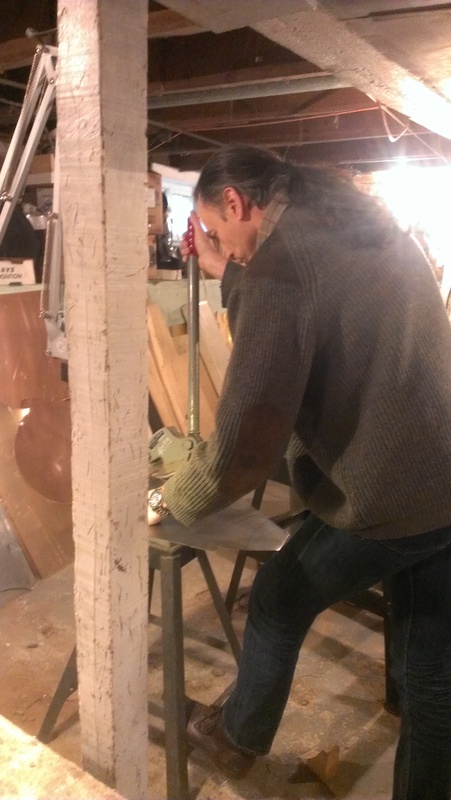 That’s me, using the shear, which I loved. Jeffrey says they had these in the Middle Ages. 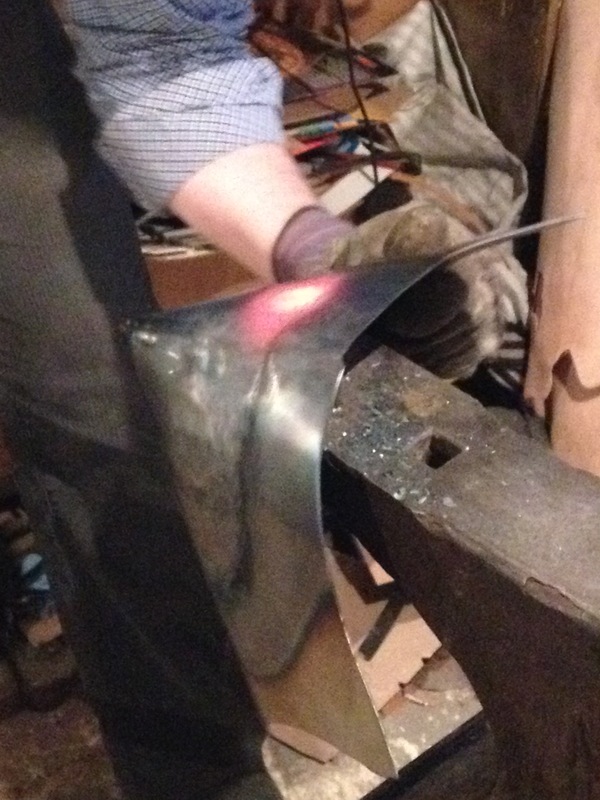 Jeffrey has already welded the cone. Aurora has already ground down the weld. In this case, pictures are worth thousands of words. Even as Jeffrey described the process of raising, he was executing it. He did one side, and he had Aurora do the other. 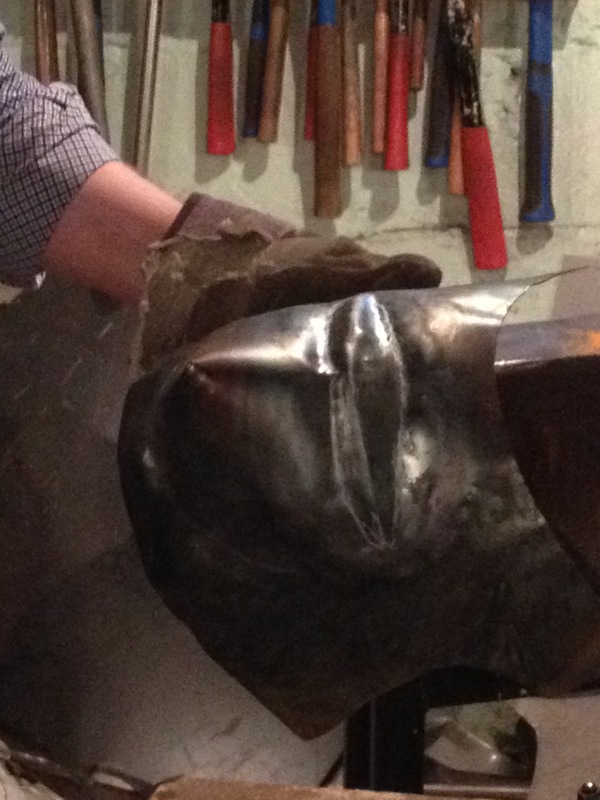 I found it remarkable how fast the visor began to take the complex shapes of the original. And at this point–all the careful calculation ended, and everything became art. Again, as a writer, I was fascinated–for a while, my craftsman–(craftspeople, really) had been all about measurement and making patterns. Now, before my eyes, Jeffrey made it all about–well, about hand-eye coordination, and skill, and long practice. Jeffrey Hildebrandt. That’s not posed–he’s thinking. What I saw was that Jeffrey would stare at the visor, comparing it to the drawing for a moment–and then apply heat and work, rapidly, on one area. Then quench it (put the whole visor in water) wipe it dry (because high-heat water turns to steam and burns you through your gloves) and stare at it again. This process was, in fact, incredibly rapid. After a while, he’d add commentary, mostly to Aurora (who understood the process far better than I) about how he needed to contract the area above the eyes to make the visor fit the helmet (oh, yes, it has to work!) or to make the snout symmetrical. Often, he’d make marks with a white stick that proved to be a soapstone pencil. Soapstone leaves marks that are not burned away by heat. And goodness, there is a lot of heat involved. 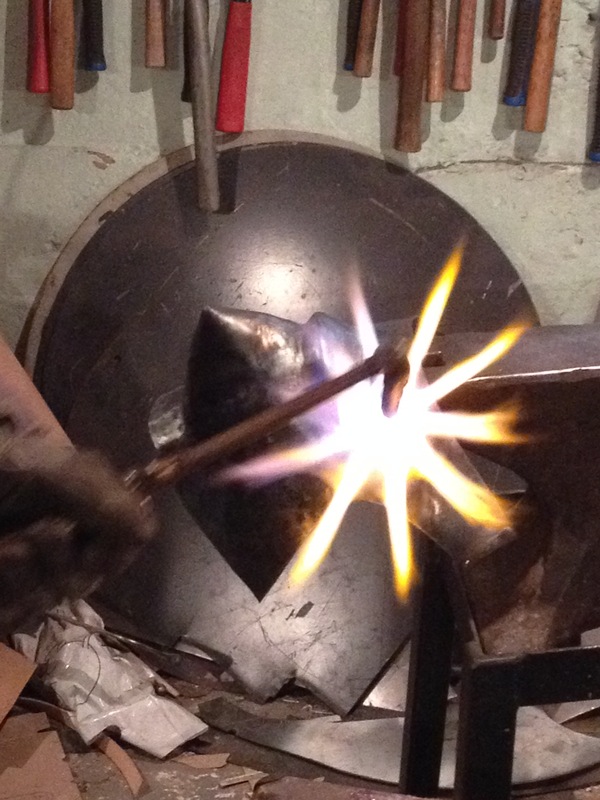 oxy propylene (or oxy acetylene) replaces the two apprentices, the bellows, and the charcoal. it’s also faster and more accurate. And there it was. four hours solid work, and it was done. No problem. Another day, I’ll do a piece on Aurora and her skills and her jewelry. This is Jeffrey’s day, though, and I found his work incredible. Jeffrey has been a professional armorer for less than three years. Before that he was a biologist. 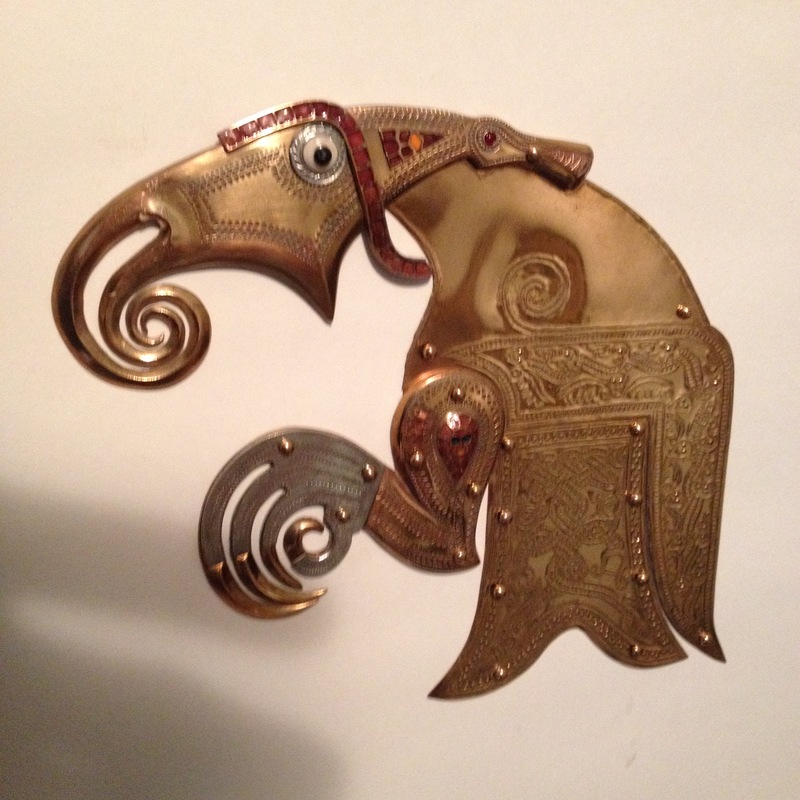 His skills–from metal moving to enameling, engraving, repousse, etching–all his metalworking skills are excellent. He challenges himself constantly to work at the edge of the envelope and try new techniques and learn new skills. I asked what his favorite period was. He said ‘I love the sixteenth century,’ but after a pause, he said, ‘I really jump around. I love to do things that are completely new.’ Speaking as an author, I agree–I love all of history, and there’s something marvelous about the moment when you dive into a new period–pick up the first broad secondary source and start the plunge. With Jeffrey I could see the width of his interest. 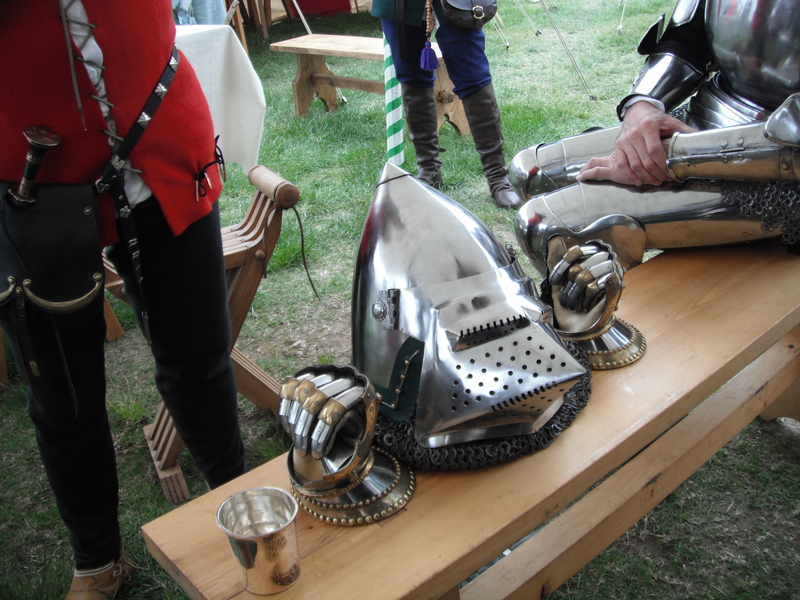 On one table was a beautifully executed, very simple sixteenth century pikeman’s helmet. See? Even the liner is correct. My 6th century BCE bronze Thorakes. It was made for me, and it fits me perfectly. MINE! Is this stunning 6th c. BCE Greek breast plate that just happened to be sitting there. Okay, it was made by Jeffrey for me, and I’ll be wearing it at Marathon in Greece, and for the rest of my life, I hope. It sure fits! Jeffrey had this in his office. 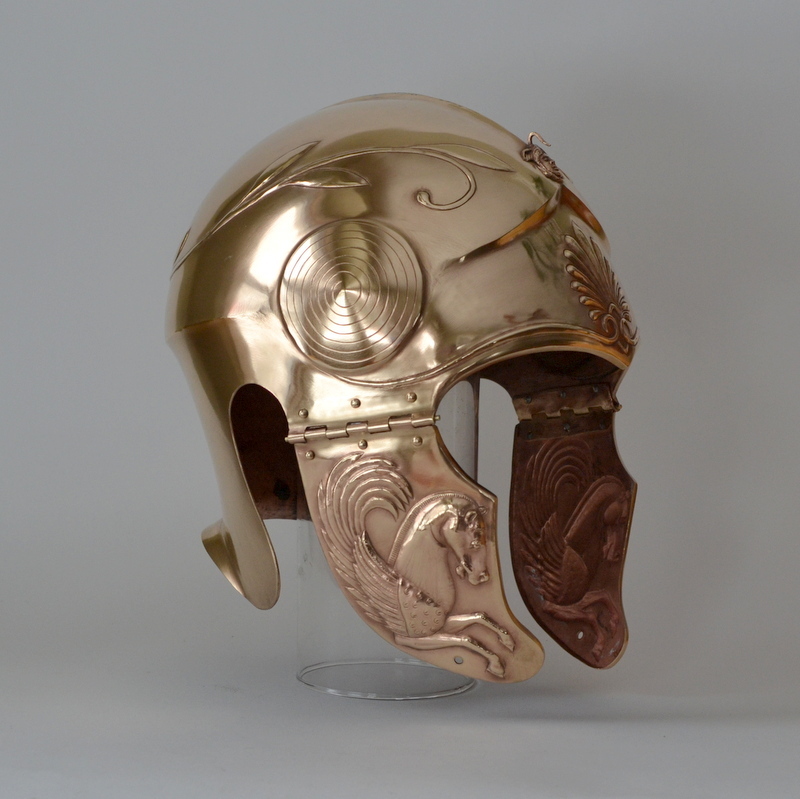 It is the Sutton Hoo shield device. Someone will have this on their shield. But not, I think, in 1385. Still, seeing the reality of it made me think of art forms and the Faery Knight. And at another remove, we can’t ever really go into the past, but people like Jeffrey Hildebrandt make it possible to get closer–to learn things you cannot learn without wearing the right stuff, made the right way. 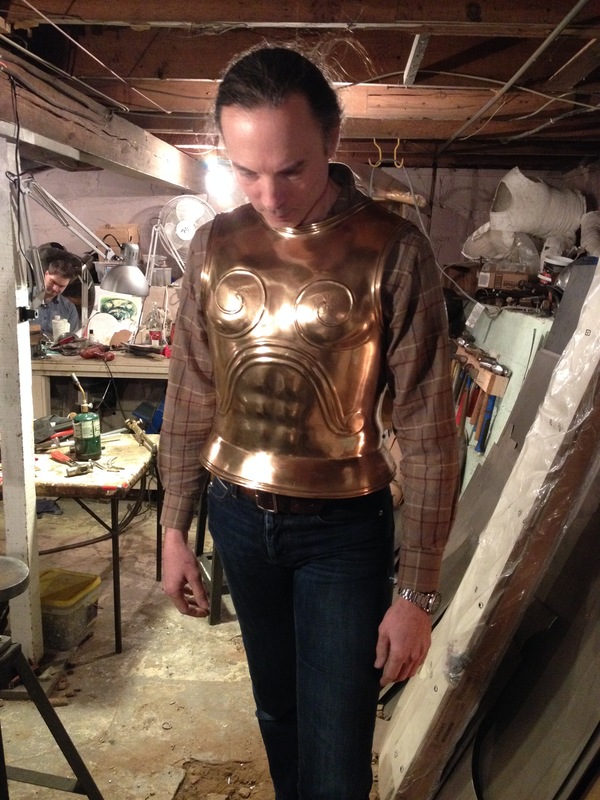 Over the next few weeks, I’ll talk about other superb crafts people–Aurora Simmons, Jiri Klipac, Leo Todeschini, Craig Sitch–but I wanted to start with a full project and a full day, and a lot of photos, just to give a notion of what goes into making a suit of armour. This was just one visor. All done but the polishing and planishing and piercing all the holes. 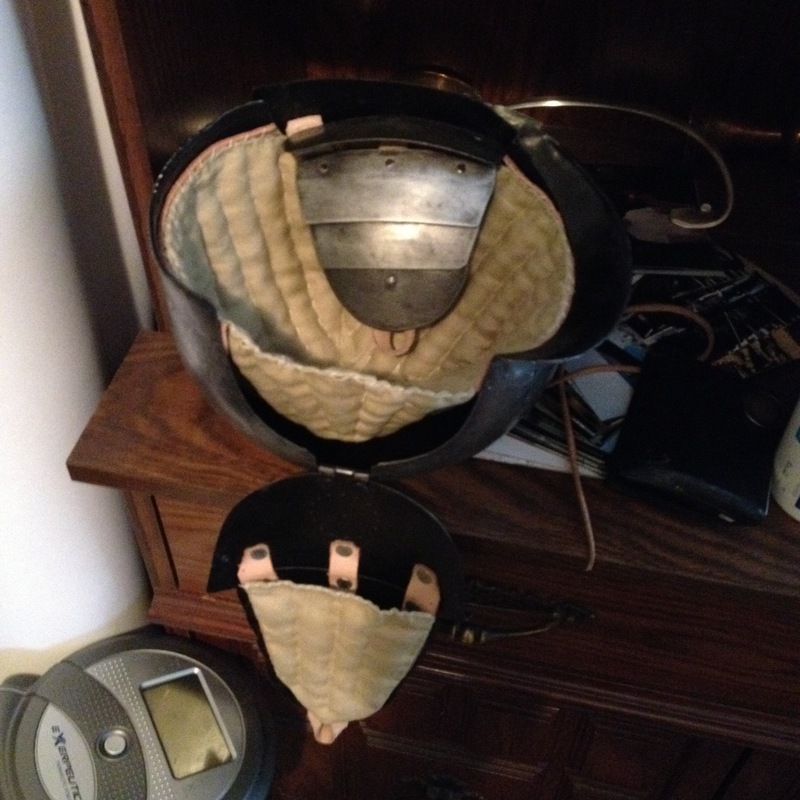 Oh, and when Aurora is done, I’ll show you the final helmet. Can you see the subtle differences from mine? SO the next time we’re fighting on the same side in a melee–I won’t hit her.